It is recommended that vendors check the City's Bids & Proposals webpage regularly for any new bids or proposals that may open. The City also posts all bids and proposals on eVA, the state procurement website. If a vendor wishes to be notified about a bid or proposal posting, the City recommends that the vendor register for eVA to receive notifications. Register as a vendor with eVA. 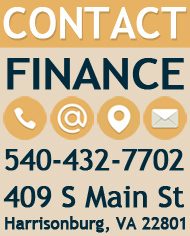 To be added as a new City vendor and receive payment for goods and services provided, a completed W-9 form is required. 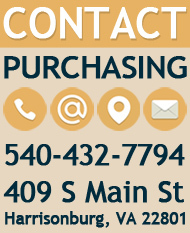 Completed forms may be emailed to Purchasing@harrisonburgva.gov or faxed to 540-432-7779. The eVA Internet electronic procurement solution, website portal www.eVA.virginia.gov, streamlines and automates government purchasing activities in the Commonwealth of Virginia. The eVA portal is the gateway for vendors to conduct business with state agencies and public bodies. All vendors desiring to provide goods and/or services to the Commonwealth are recommended to participate in eVA by registering as a vendor. There is no cost to register as a vendor on the website. The portal will provide you with automatic notifications when a bid/proposal is posted by a supplier seeking goods/services in your field, as well as notifications when an update is made (i.e. addenda issued, award notification issued, etc.). 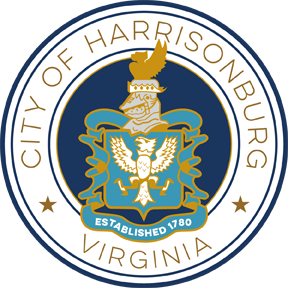 In addition to posting all bids/proposals on the City's website at www.harrisonburgva.gov/bids-proposals, the City also posts all bids/proposals on the eVA website. RSS feeds allow you to subscribe to updates on HarrisonburgVA.gov. You will need a RSS reader application or online service to browse, open, and subscribe to RSS feeds. There are many free readers available in order to subscribe to our feeds; examples are Bloglines, Google Reader, Mozilla Firefox, and NewsGator. For new Invitations to Bid, subscribe to the Bids feed. For new Requests for Proposals, subscribe to the Proposals feed. To be notified of all new bids and proposals and when an addendum is added to bids and/or proposals, subscribe to the Recently Updated Bids feed.